we’ll focus on how you can design a more water-efficient golf course, ensuring that you don’t spend money like, well, water! In 2003, the total volume of water used for golf irrigation across the UK’s 2 752 golf courses was estimated to be 4 315 million litres—that equates to an average 1,2 to 3 million litres or 5 848 million cubic meters (m³) per day! Yet water audits performed across the UK suggest that many golf courses use 20-50% more irrigation water than necessary. Reducing this overuse through efficient irrigation can save golf courses 190-1 893m³, or more, per year. One of the greatest impediments to achieving water savings in this sector is the common disconnect between the person who pays the water bills, the owner(s), the course manager, and the various contractors who maintain the facility and equipment. Water saving potential is vast, but successful implementation requires a cooperative effort from everyone involved. A typical golf course requires 100 000 to 1 000 000 gallons (378.5-3 785m³) of water per week in summer to maintain healthy vegetation. Turf requires an average of 25 to 60 inches (63.5 cm to 152.4 cm) of water annually, depending on climate, to maintain a healthy appearance. Most of this water is required during summer months (1.5 to 2 inches per week or 3.8 cm to 5.08 cm), when rainfall is lowest. Yet, unlike trees and shrubs, turf grasses have very little capacity to store water and withstand periods of drought. Golf course turf usually needs water applied at least twice per week in the summer, but any deficit in rainfall must be supplemented with irrigation. 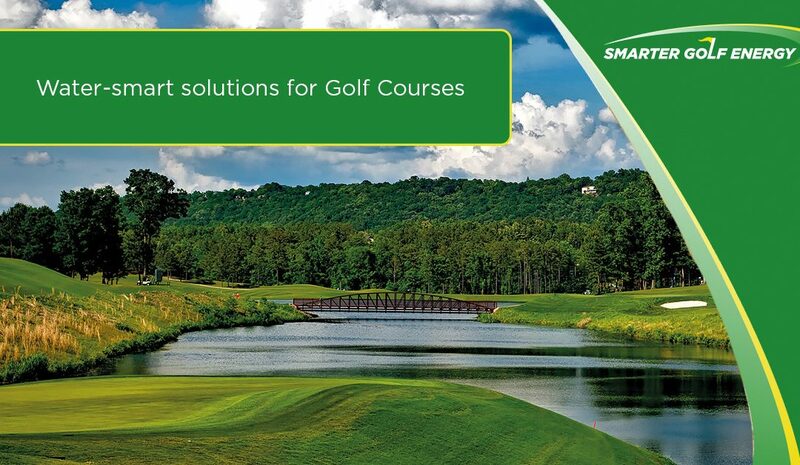 Furthermore, the irregular shape and hilly terrain of courses makes water retention difficult. In addition, irrigation must occur during limited evening hours, rather than when the soil’s water absorption rate is at its peak. All these issues can lead to excessive water use. These are some of the common limitations to golf course water efficiency. In the next article, we’ll focus on golf course designing basics and how you can work with your existing landscape to save water. In the meantime, you can contact us here to get more expert advice on how you can save with our smart water solutions.